john4jack (Corvallis, Oregon, United States) on 23 November 2009 in Transportation and Portfolio. Amazing light and shadow...wonderful mono! 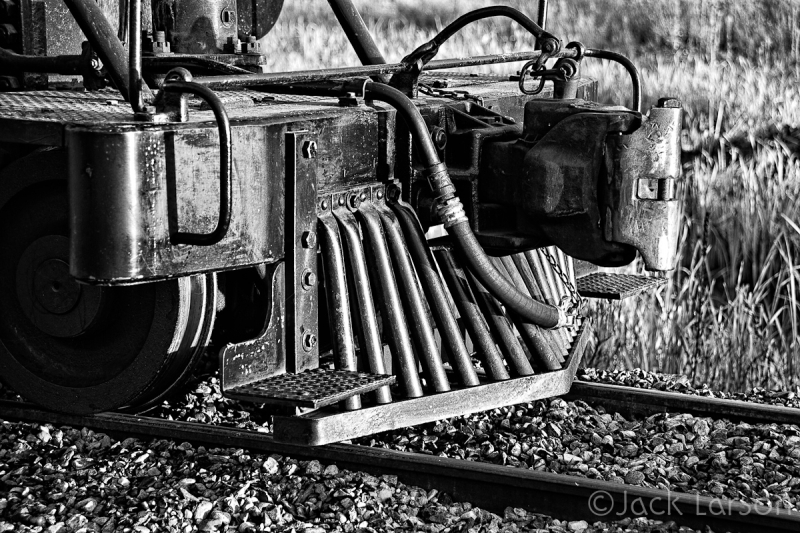 I like very much the b/w and, of course, the details of this old machine. I've never thought that this was a cow-catcher! great! Fantastic detail in this b&w capture. It looks like a pencil drawing. Fantastic. Fabulous B&W and close-up and such a thought-provoking title, Jack ! @k@: It's what they called the front of those old engines. bw perfect for me. Love this subject ! Perfect B&W! The feeling is that it has been freshely greased and shined! Wonderful detail! Cool BW shot ! I can feel the strength of solid metals. Love the mono treatment. Love the details. Love the light. Pardon my ignorance, but it catches cows? @Nicholas: I'm not certain they caught many cows, but that is what they called the gizmo on the front of the engine. Exquisite detail. The b&W really works..just excellent! I didn't know where those things were made for. A very stylish detail for N / B bright and beautifully contrasted! So, do you feel any older today? @Judy: Not particularly older, but infinitely wiser!! this is a beautifully layered image. Great details and perfect contrast. Oh, such wonderful details, Jack! Love this in B&W! Again, such an impressive shot. Wonderful detail and perfect b&w processing! Super closeup. BW is awesome ! A fine close up of this important element of older trains. I especially like the nice range of tones you produced with your exposure and processing. The bright highlights makes the metal parts very attractive. Very well done. Stunning b&w with superb tones! an imposing image, outstanding b&w and details !! It is massive and squat as aurochs, it is also graphic, beautiful in its stark contrasts of B & W, I like this light that flashed steel and thoroughness of detail, ground full of gravel. I like the force that emanates from it and the angle of view that puts so much value .. force haunting .. Bravo Jack. Very clear and sharp image, well done! beautiful details and dof, excellent contrast! @micke bergling: Thank you. I can't find you on Am3. Beautiful detail captured in this BnW. @dj.tigersprout: Thanks, dj, for all of your recent kind comments. Un excellent plan serré sur le détail de ce magnifique devant de locomotive ancienne! Très beau NB! A little preference for the colored pictures. But anyway, a very good composition. Gorgeous composition and B&W. Superb! Beautiful shot, but what a gruesome thought...."cow catcher" !!!! @Susan: I don't think many cows have been caught. The composition and the light on the steel are magnificent. Un b&W excelente. Nítido y contrastado. Buena selección de enfoque. Handsome details....love the silvery glow of the black and white ! May be buffalo catcher? Nice details. I really like the old steam engines. This is an excellent b&w with a lot of interest to it. I think the tone of the shot is really bringing out power of the engine. Such great shot...I like your point of view! A lovely crackingly sharp B+W shot. Love all your train shots, but this B&W is my fav! Something about an old train and B&W..... great job!